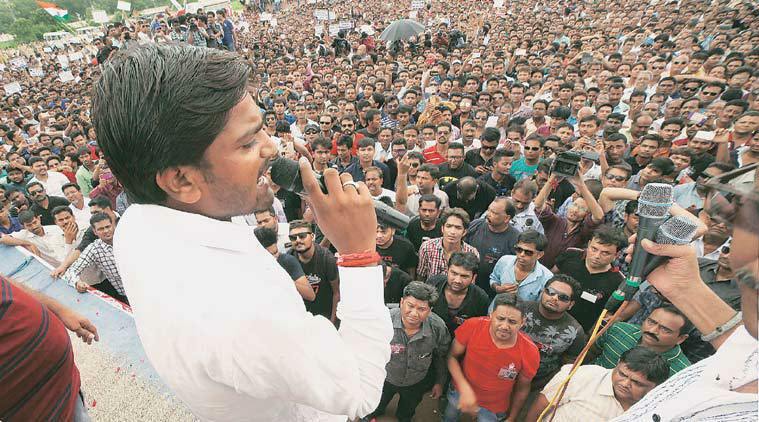 Many Patels in Gujarat are agitating for Other Backward Caste status, in order to access the same “Reserv­ation” benefits as Scheduled Castes, Schedules Tribes and Other Backward Castes. Reservations are a quota based form of affirmative action, through which a certain percentage of government jobs and places in educational institutes are guaranteed to members of certain communities in India which are traditionally disadvantaged. Large gathering of Patels have taken place, which in some pockets have turned into riots, with damage to property, injuries and a number of deaths. Patels in Gujarat make up about 12% of the state’s population. They are considered to be economically well off. But there are social problems, in particular youth unemployment and lack of opportunities for those not already born wealthy. There is reportedly a high suicide rate amongst unemployed youth. I understand that when you’re actually living in the midst of a depressing reality,where youth from your community are lumpen and direction-less, often drinking alcohol all day with nothing to do, and you see that another community (caste) can get decent jobs and gain entry into reputable educational institutions with lower performance, it is difficult to accept and causes resentment. One approach is to agitate to try and scrap reserv­ ations in total. Indeed, Gujarat has seen anti-reservation agitations in the past, and Patels were considered to be a major part of this. But perhaps over time it is becoming clear that no political party is going to scrap reservations due to the political fall out. No political party expects to be able to come to power if it antagonises the communities that benefit from reservation, risking making them vote en bloc against themselves. So a section of Patels have taken an “if we can’t beat them, join them” attitude. It is sad, but understandable. One only hopes that some sanity will one day prevail to affect a total re-evaluation of the basis of affirmative action in India. Affirmative action from the state should only be based on helping those in poverty to have opportunities; qualification for the benefits should not be based on caste. In today’s India you frequently find schedules caste or other backward caste families very well off, and supposedly upper caste families mired in poverty. The importance of caste in Indian life would have greatly diminished by now if it wasn’t for this out of control monster of a system that has made castes into permanent political formations. Even B. R. Ambedkar who was one of the founders of the system of reservations only envisioned it to be a short term time bound measure, not a permanent fixture of India for centuries to come. It is a sad reflection on the part of twist history and religion. The British as early as 1820AD when they tried for census understood the complexities of INDIA SOCIAL GROUPS that they were fully aware of the fact that CASTE as understood in WEST was not practised in INDIA. They understood that there were only communities in India which according to the needs of a particular place were given social hierarchy.The common standards of HIERARCHY for upward mobility was not SAVARNA but–abstain from non vegetarianism/alocholism/not marrying more than once and certain amount of RELIGIOUS way of life. That is why but for UP AND PUNJAB in most of the States the communities which claimed the status of KSHATRIYAS were often down the SHUDRAS–VIZ.,KAYASTHAS IN THE HINDI BELT AND FARMING CLASS THROUGHOUT REST OF THE COUNTRY. Unless a meeting of all REPRESENTATIVES OF COMMUNITIES are convened to take decision boldly on RESERVATION giving up the RIGIGDITY ON SAVARNA AND MANU LAW termed as HINDU LAW there will be no solution to this eternal problem. Blaming BRAHMINS OR MANU LAW will be only diversionery tactics and not part of solution. The reservation has to reach the real needy. In the current set of enrolled SC & ST & OBC itself, the government should up their priority in increasing the reach of reservation benefits to higher percentage of people. That is enough to uplift India. But that’s a very bold and arduous task.